Not to be confused with Schengen, Luxembourg or Schneverdingen. For the chess opening, see Sicilian Defence, Scheveningen Variation. For the chess tournament system, see Scheveningen system. Scheveningen [ˈsxeːvənɪŋə(n)] ( listen) is one of the eight districts of The Hague, Netherlands, as well as a subdistrict (wijk) of that city. Scheveningen is a modern seaside resort with a long, sandy beach, an esplanade, a pier, and a lighthouse. The beach is popular for water sports such as windsurfing and kiteboarding. The harbour is used for both fishing and tourism. 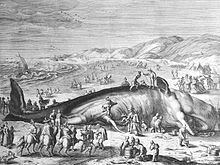 The engraving by William van der Gouwen shows a 20-m-long (70 ft) whale, stranded on the Dutch coast between Scheveningen and Katwijk on February 3, 1598. The earliest reference to the name Sceveninghe goes back to around 1280. The first inhabitants may have been Anglo-Saxons. Other historians favour a Scandinavian origin. Fishing was the main source of food and income. The Battle of Scheveningen was fought between English and Dutch fleets off the coast of the village on 10 August 1653. Thousands of people gathered on the shore to watch. Montagu's flagship picked up the English king at Scheveningen in order to accomplish the Restoration. A road to neighbouring The Hague was constructed in 1663 (current name: Scheveningseweg). In 1470, a heavy storm destroyed the church and half the houses. The village was again hit by storms in 1570, 1775, 1825, 1860, 1881, and 1894. After this last storm, the villagers decided to build a harbour. Until then, the fishing boats had had a flat bottom (bomschuiten), and were pulled up the beach. By around 1870, over 150 of these boats were in use. Once the harbour had been constructed in 1904, more modern ships replaced the bomschuiten. In 1818, Jacob Pronk constructed a wooden building on a dune near the sea, from where people could bathe from four separate rooms. It marked the start of Scheveningen as a bathing resort. Since then, Scheveningen has attracted numerous tourists from all over Europe, notably from Germany. The hotel and restaurant Kurhaus was opened in 1886. The village attracted a number of Dutch artists over the centuries, who painted the bomschuiten drawn up on the beach, or fishermen at work in the North Sea. Notable painters who recorded the village include Adriaen van de Velde, Simon de Vlieger, and Hendrik Willem Mesdag, whose large panorama, 14 m high and 120 m wide, preserves the view of Scheveningen in 1881. The International Skating Union was founded in Scheveningen in 1892. Anecdotal evidence exists of the name Scheveningen being used as a shibboleth during World War II to identify German spies: they would pronounce the initial "Sch" differently from Dutch native speakers. 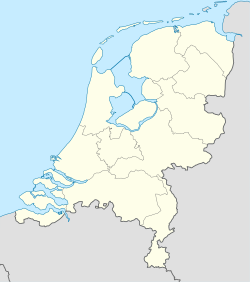 Contrary to popular belief, Scheveningen was never an independent municipality, but it has its own coat of arms, officially recognised by The Hague local council (proposal 136 of 23 March 1984); even in the Middle Ages, it was part of the same administrative region as The Hague; the region had a special status within the county of Holland because of the presence of the Count of Holland. Nevertheless, Scheveningen always had a strong identity of its own. For instance, it had its own football club, playing in the highest Dutch division (its name was "Scheveningen Holland Sport"). In the course of the second half of the former century, this club was forced to merge with ADO Den Haag. From 21 April 1960, the pirate radio station Radio Veronica  broadcast its programmes from an anchorage in the North Sea about four miles off the Scheveningen coast, originally calling itself Vrije Radio Omroep Nederland (VRON); Free Radio Station [of the] Netherlands. It was joined by Radio Noordzee Internationaal in 1970  and the relaunched Radio Caroline in late 1972. When the Netherlands ratified the Treaty of Strasbourg on 1 September 1974, Veronica applied for legal status and became the VOO, Caroline moved anchorage to the English coast, and RNI closed down completely. Memorable episodes during this period included the stranding of Radio Veronica's ship, the Norderney, which lost its anchor in a storm and ran aground on Scheveningen beach on 2 April 1973, and a firebomb attack on RNI's ship, the Mebo II, on 15 May 1971. Slobodan Milošević, the 3rd president of Serbia and Montenegro was found dead in his prison cell on 11 March 2006 while he was being held in the UN war crimes tribunal's detention center in Scheveningen. Scheveningen is mentioned in the Jacques Brel song "Mon père disait", saying that when the North wind blows in Scheveningen, it feels as if the town has lost its anchor and gone adrift on the North Sea. In Scheveningen, a small number of predominantly elderly women are still wearing local Scheveningen costume. It is to be expected that this will soon be a thing of the past. The local dialect, the Scheveningen dialect, is hardly spoken by young people anymore. Because of the closedness of the original village community, Scheveningen has many equal surnames. This led to the introduction of nicknames in local parlance in order to distinguish families better. For example, certain members from the Pronk family were known as 'the horse man', 'Piet the mouse', 'Born without a tooth' or 'Gerrit de sermon'. If you were a Pronk, a Scheveninger automatically asked 'who are you from?' to which the person addressed reacted with, for example, 'from the horse man'. Some common 'typical Scheveningen' family names are, for example, Bal, Dijkhuizen, Korving, Den Heijer, Knoester, De Niet, Plugge, Pronk, Rog, Spaans, Taal, Toet, Vrolijk, Zuurmond and Van der Zwan. Through the opening up of the fishing village from the beginning of the 20th century, this phenomenon has gradually become obsolete. Vreugdevuur from second christmas day to new year's eve: a large competition between two subdivisions of Scheveningen (Duindorp and Scheveningen dorp) to build the largest tower made out of pallets and then lighting it on fire to signall the beginning of the year, Duindorp currently holds the world record. Our Lady of Lourdes (RC) Silent Center, in a designated national landmark complex, housing a replica of the Lourdes Grotto in Massabielle (France). The chapel, located at Berkenbosch Blokstraat 9a, is open daily from 9 am to 6 pm. Night life centres on Pathé Scheveningen movie theatre, and the sea-front boulevard with its bars, restaurants, gambling halls, and other entertainment. Church of St.John and St.Phillip The Hague part of the Diocese of Europe in the Anglican Communion. The light beam flashes at alternate intervals of 2.5 and 7.5 seconds. The location is 52°6.247′N 4°16.095′E﻿ / ﻿52.104117°N 4.268250°E﻿ / 52.104117; 4.268250 . ^ Dictionary of national biography. [Edited by Leslie Stephen and Sidney Lee, etc.]. London: Oxford University Press. XIII., pp. 680-681. ^ McNamara, Tim (2005). "21st century shibboleth: language tests, identity and intergroup conflict". Language Policy. Springer Netherlands. 2005 (4): 351–370. doi:10.1007/s10993-005-2886-0. ^ "BBC NEWS | Europe | Milosevic found dead in his cell". news.bbc.co.uk. Retrieved 2017-02-21. ^ "Klederdracht". www.vlaggetjesdag.com. Retrieved 12 May 2018. ^ P. van der Eijk (10 September 2004). "Oe 't ôit vrooger 'eweest 'êt". www.nrc.nl. Retrieved 27 March 2018. ^ "Scheveningse familie namen". www.allemaalscheveningers.nl. Retrieved 12 May 2018.